Slow or clogged drains? T.Webber has your back for same-day drain cleaning services. Drain clogs: not only are they an inconvenience, but left untreated can wreak havoc on your drain system. Whether it’s clearing a shower drain stopped up with hair or rescuing the stuffed toy your child flushed down the toilet, T.Webber’s Plumbing & Drain Experts have the tools, knowledge and experience to clear your drain clog and get your water and waste flowing as it should. In addition to clearing your drain clog, T.Webber technicians can also treat your drains with BioOne – a natural, friendly bacteria to help eliminate buildup of fats, oils, and grease to prevent future drain issues. 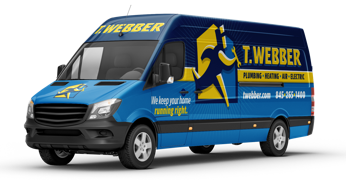 For friendly service, fast – call T.Webber. Our Plumbing & Drains Experts are available throughout the Hudson Valley, including: Dutchess, Putnam, Westchester, Orange, Ulster & Rockland County. Fully licensed and insured, we are available seven days a week to resolve your drain clog woes.